The floppy disk interface uses what is likely the strangest cable of all those in PCs today. It is similar to the standard IDE cable in that it is usually a flat, gray ribbon cable. It is unusual in terms of the number of connectors it has and how it is used to configure the setup of the floppy disks in the system. Controller Connector: The single connector on one end of the cable is meant to connect to the floppy disk controller, either on a controller card or the motherboard. Drive A Connectors: The pair of connectors (or single connector in the case of a three-connector cable) at the opposite end of the cable is intended for the A: floppy drive. This is explained in more detail below. Drive B Connectors: The pair of connectors (or single connector in the case of a three-connector cable) in the middle of the cable is intended for the B: floppy drive. The reason that the standard cable uses pairs of connectors for the drives is for compatibility with different types of drives. 3.5" drives generally use a pin header connector, while 5.25" drives use a card edge connector. Therefore, each position, A and B, has two connectors so that the correct one is available for whatever type of floppy drive being used. Only one of the two connectors in the pair should be used (they're too close together to use both in most cases anyway). The more common pin header (IDC) connector is shown below. The three-connector cables are found either in very old systems or in ones where the manufacturer was trying to save a few pennies. They reduce the flexibility of the setup; fortunately these cables can be replaced directly by the five-connector type if necessary. 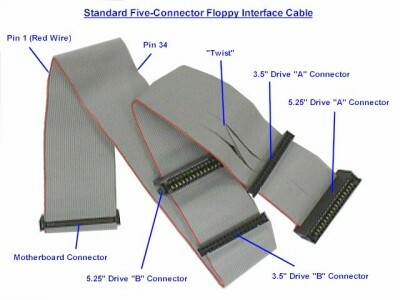 You will also notice that there is an odd "twist" in the floppy cable, located between the two pairs of connectors intended for the floppy drives. Despite the fact that this appears to be a "hack" (well, it really is a hack), this is in fact the correct construction of a standard floppy interface cable. There are some cables that do not have the twist, and it is these that are actually non-standard! What the twist does it to change the connection of the drive on the far end of the twist so that it is different than the drive before the twist. This is done to cause the drive at the end of the cable to appear as A: to the system and the one in the middle to be as B:. Since the signals are inverted, the drive after the twist responds to commands backwards from the way it should; if it has its drive select jumpers set so that it is an A: device, it responds to B: commands, and vice-versa. One might ask why the twist was needed. In short, because it was a big time-saver during setup back in the days when it was quite common to find two floppy drives in a machine. Without the twist, for two floppy drives to be used, one had to be jumpered as A: and the other as B:. With the twist, it was possible to leave them both jumpered as B:, and whichever was after the twist will appear to the system as A: because the control lines are inverted. Changing which drive is A: and which is B: is as easy as switching the cable. In systems with only one floppy drive, only the connector after the cable should be used. Large manufacturers, therefore, could arrange to have all of their floppy disks configured the same way without having to pull jumpers as the PC was assembled. In order for this system to work, both drives must be jumpered as B: drives. Since the floppy cable with the twist is standard, this jumpering scheme has become the standard as well. Virtually all floppy disks that you purchase come pre-jumpered as B: drives so that they will work with this setup. If this whole idea sounds similar to the seldom-used cable select protocol for IDE/ATA hard disks, that's because it is essentially the same thing. IDE/ATA hard disks require you to change the master/slave jumpers in a similar manner, and cable select was invented to do away with this. The difference is, as usual, just one of inertia and history; the floppy drive system is the standard while cable select never caught on for hard disks. Some newer BIOSes have taken things a step further. They include a BIOS parameter that will invert the A: and B: signals within the controller itself. When enabled, this lets you reverse whichever drive is A: with the one that is B:, without requiring you to even open the case. Note however that this is not compatible with all operating systems: in particular, both Windows NT and Linux can malfunction with this swap feature set, which can cause serious problems when trying to install the operating system. The reason this happens is that the swap setting only affects the way the BIOS handles the floppy drive, and confuses operating systems that go directly to the hardware. Apparently, there is yet another floppy cable variant out there, that is used by some manufacturers. In this setup, there are actually two twists in the floppy cable. The drive placed after the first twist, in the middle of the cable, is A:, much as it is with the standard one-twist cable. The drive placed after the second twist is B:. The second twist "reverses" the effect of the first one and makes the connector at the end of the cable operate the same way a drive that appears before the twist in a regular cable does.